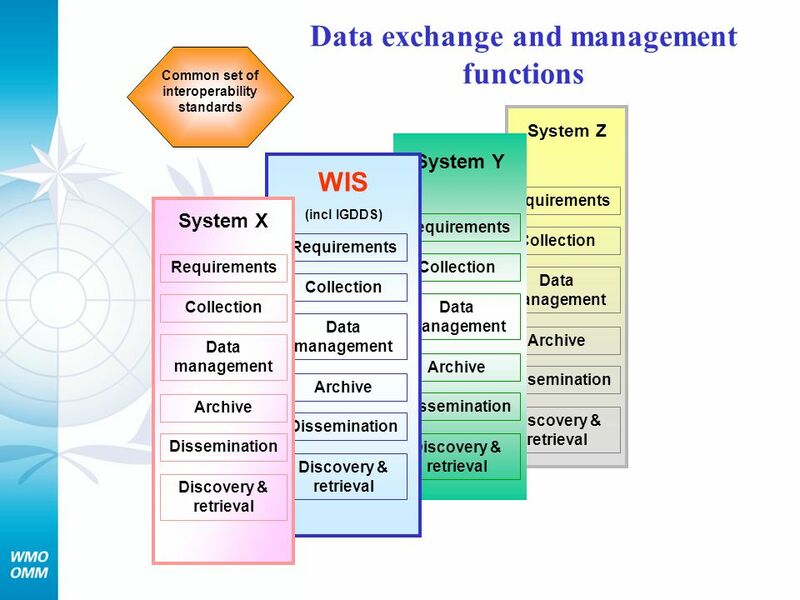 The multiplicity of systems of the different Programmes causes incompatibilities, inefficiencies, duplication of efforts and higher overall costs. 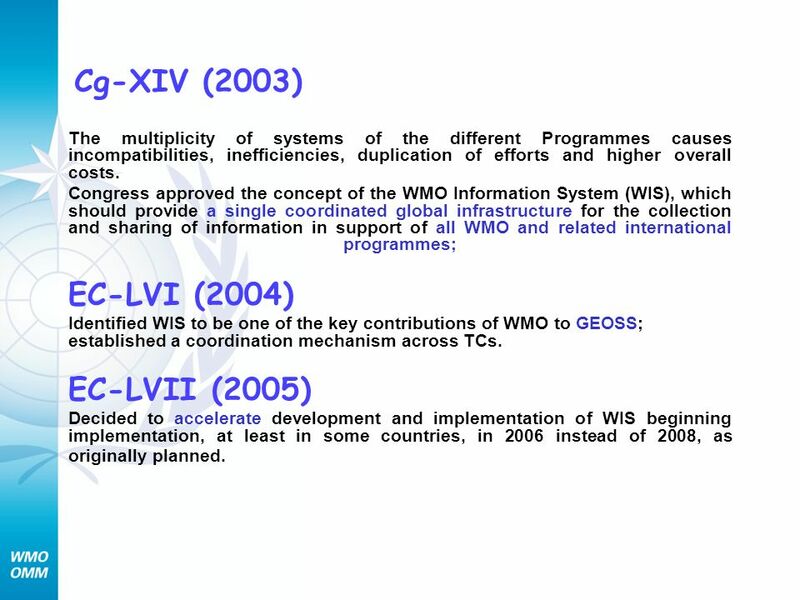 Congress approved the concept of the WMO Information System (WIS), which should provide a single coordinated global infrastructure for the collection and sharing of information in support of all WMO and related international programmes; EC-LVI (2004) Identified WIS to be one of the key contributions of WMO to GEOSS; established a coordination mechanism across TCs. 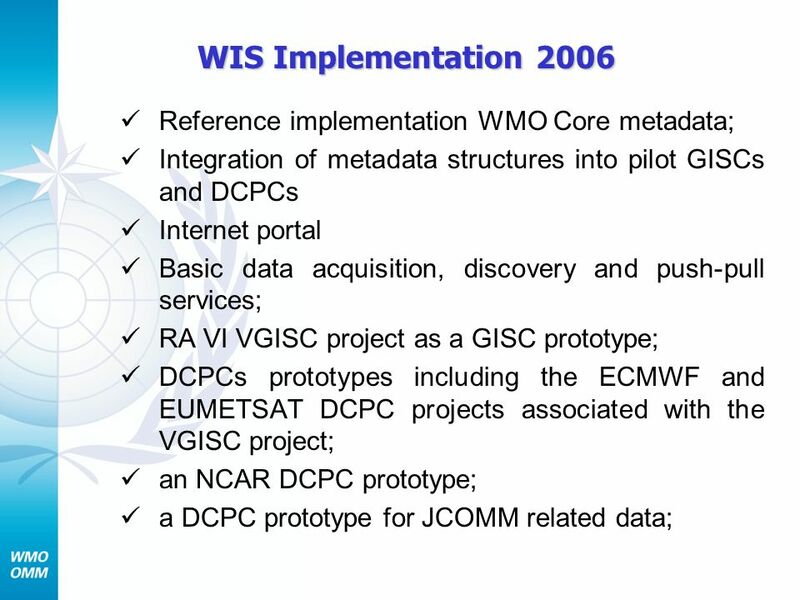 EC-LVII (2005) Decided to accelerate development and implementation of WIS beginning implementation, at least in some countries, in 2006 instead of 2008, as originally planned. 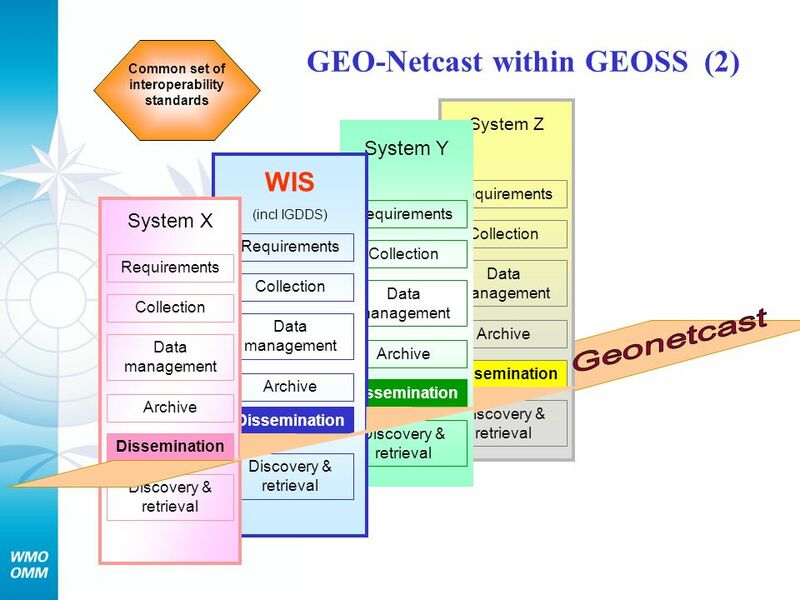 GEO-NETcast (a component of GEO-ISS) provides a high-capacity (satellite dissemination) service available for all GEO themes GEO-NETCast will have certain components in common with WIS, e.g., IGDDS/EUMETCAST is a contribution to GEO-NETCast & WIS use of common data management standards GEO-NETcast governance will take into account the overall GEO-ISS architecture and requirments of data providers and users, and infrastructure providers GEO-Netcast is an initiative led within the GEO framework by EUMETSAT, NOAA and WMO to address the global dissemination needs of GEOSS environmental data in a coordinated way. 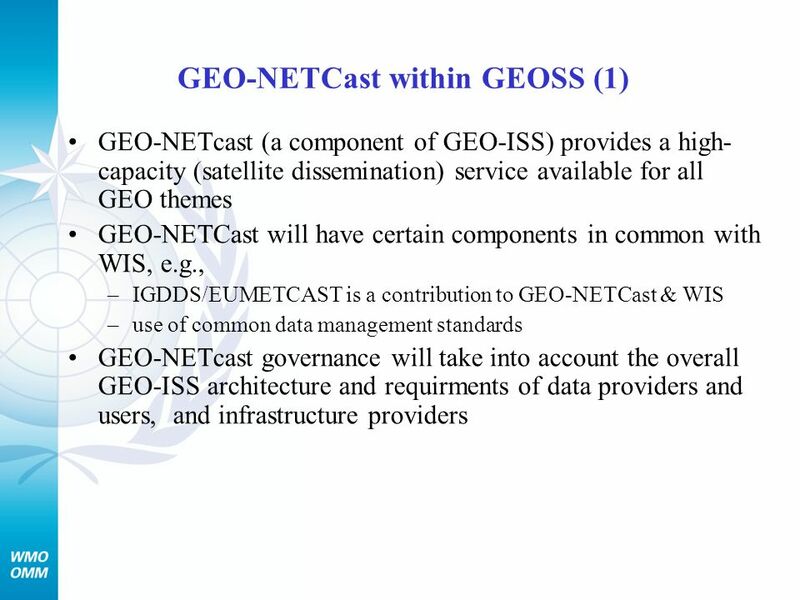 The GEO-Netcast concept is to use the multicast capability of a global network of communications satellites to transmit environmental satellite and in situ data and products from providers to users within GEO. Commercially available technology provides cost-efficient solutions with easy to implement terminals, which are widely used for Direct to Home digital television. 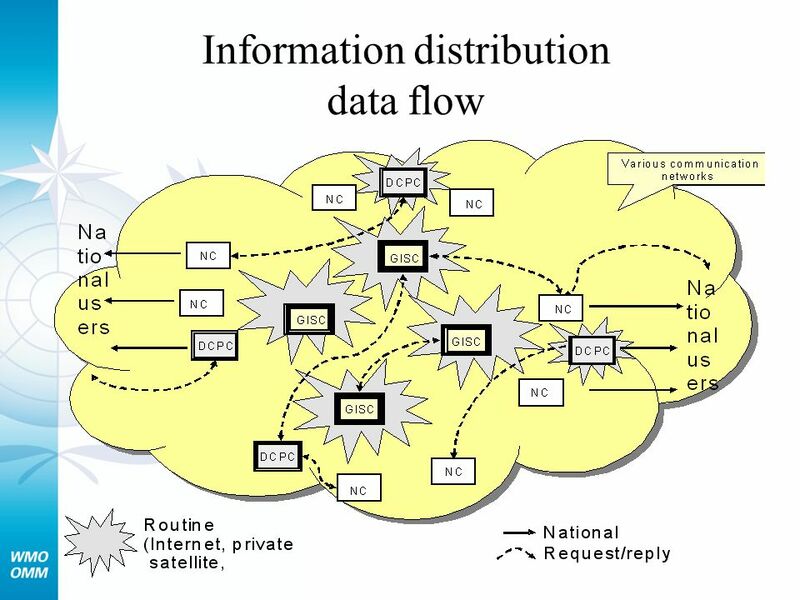 The multicast capability allows different data sets to be handled in parallel regardless of the source. 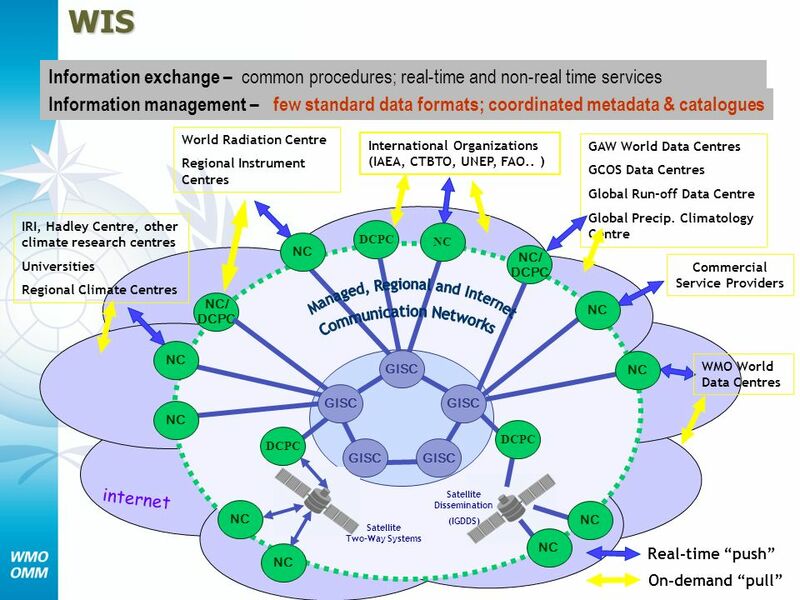 The use of a key access capability enables to respect the data policy of each data provider and to target the distribution at individuals or groups of users as appropriate, within the footprint of each satellite. 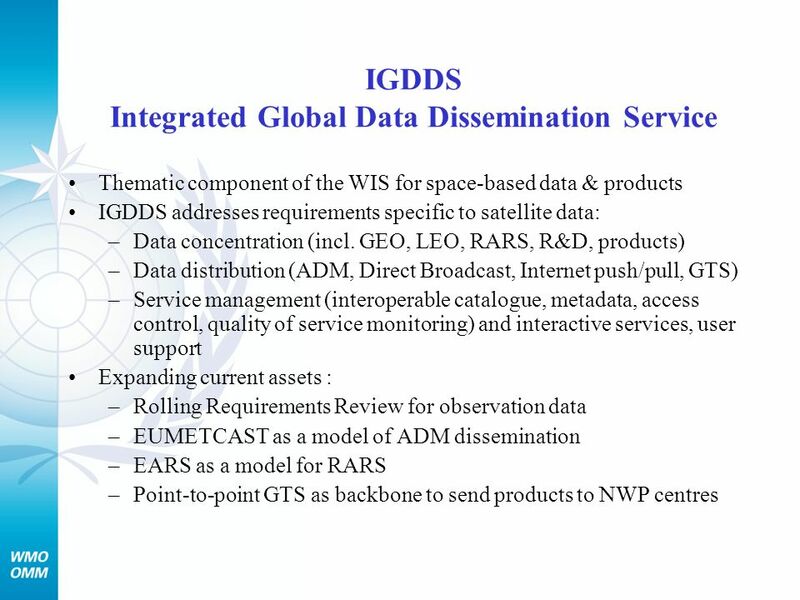 GEO-Netcast builds on the experience gained by EUMETSAT with the EUMETCast operational dissemination system and on the WMO IGDDS concept. 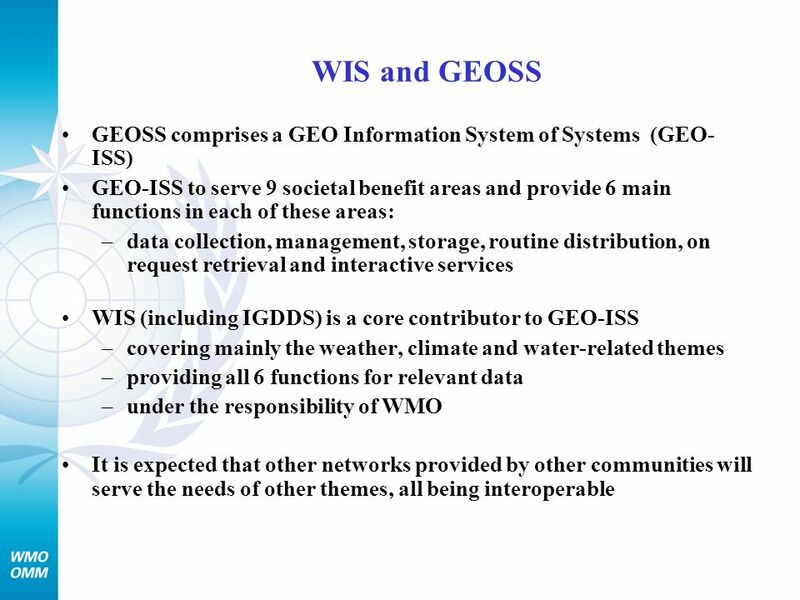 It proposes to expand this approach in order to establish a true global dissemination system responding the needs of all the nine GEO societal benefit areas. 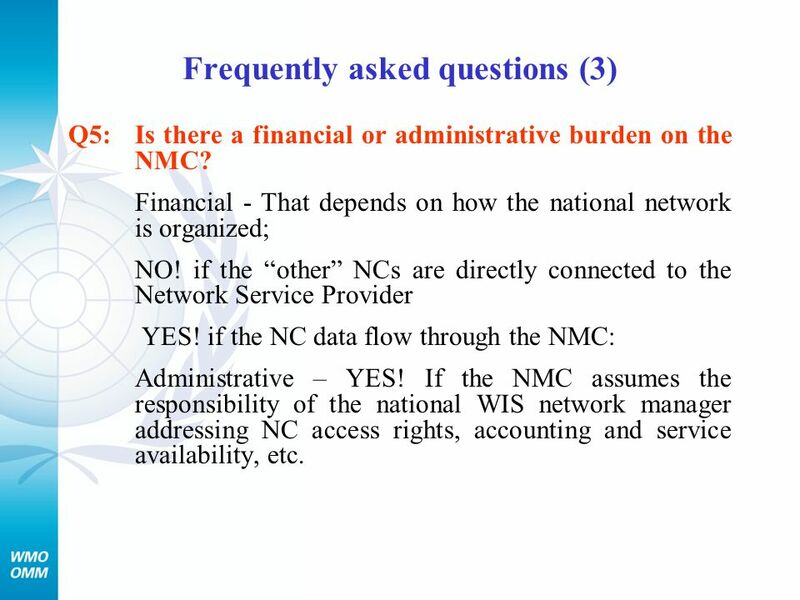 Q5:	Is there a financial or administrative burden on the NMC? Financial - That depends on how the national network is organized; NO! if the “other” NCs are directly connected to the Network Service Provider YES! 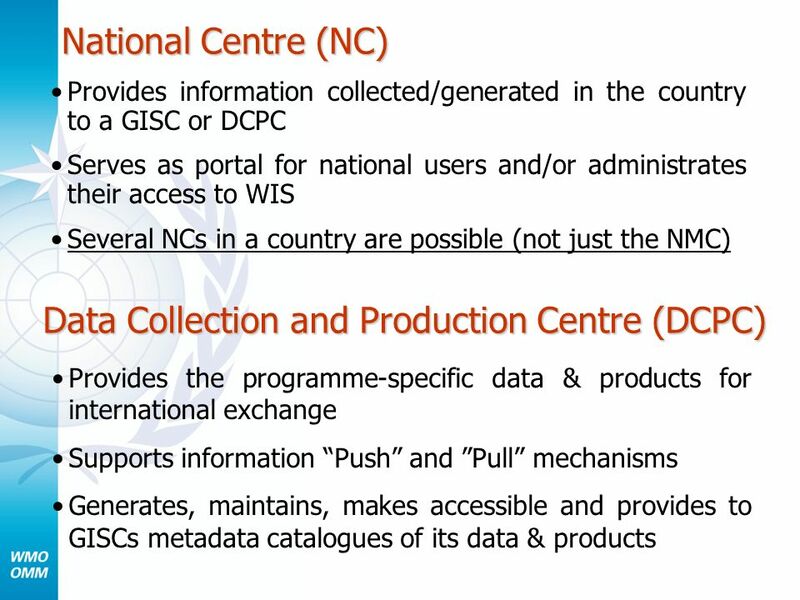 if the NC data flow through the NMC: Administrative – YES! 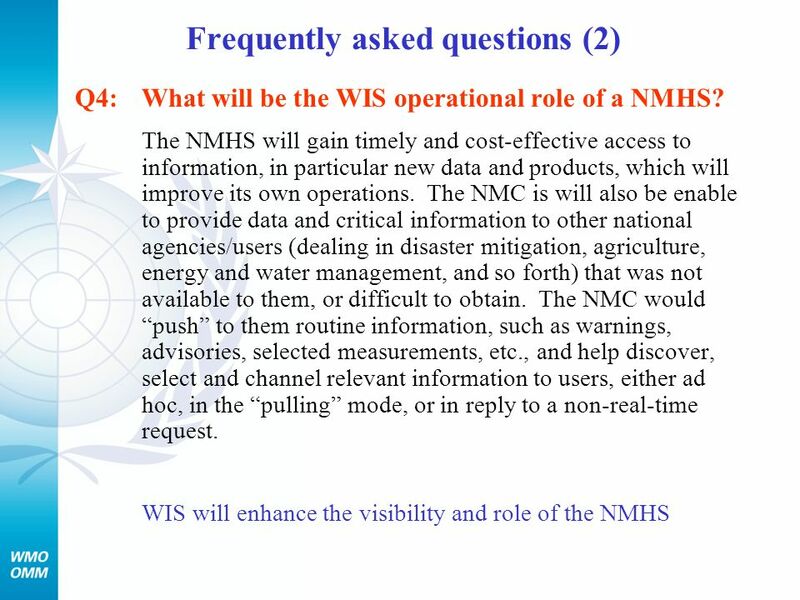 If the NMC assumes the responsibility of the national WIS network manager addressing NC access rights, accounting and service availability, etc. 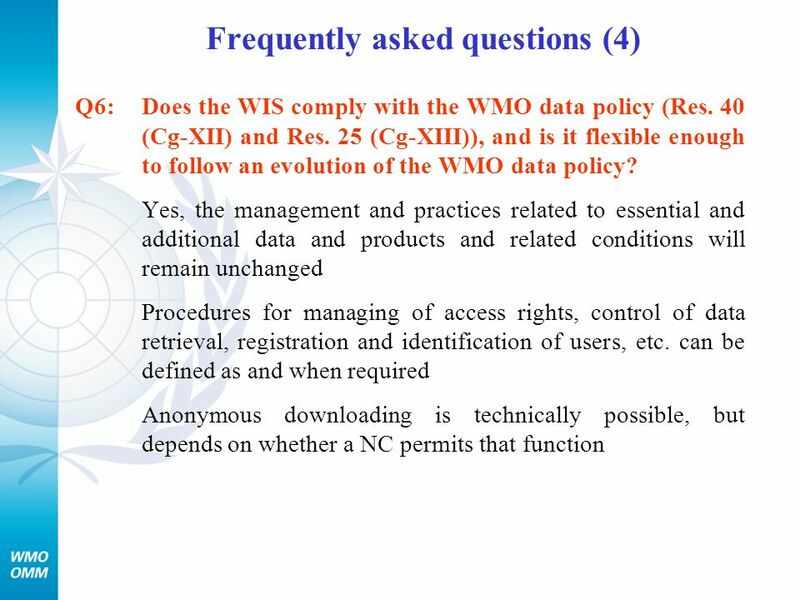 Q7:	Are there implications in connection with relevant international law, convention, such as copyright, patent, etc.? 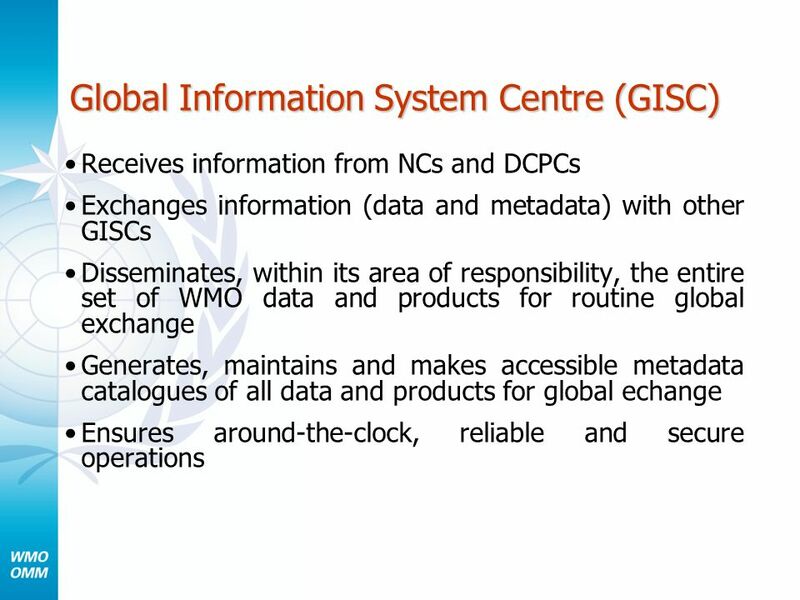 WIS has no system-inherent features that would violate international legal frameworks; the control procedures are fully within the responsibility of the NMCs. 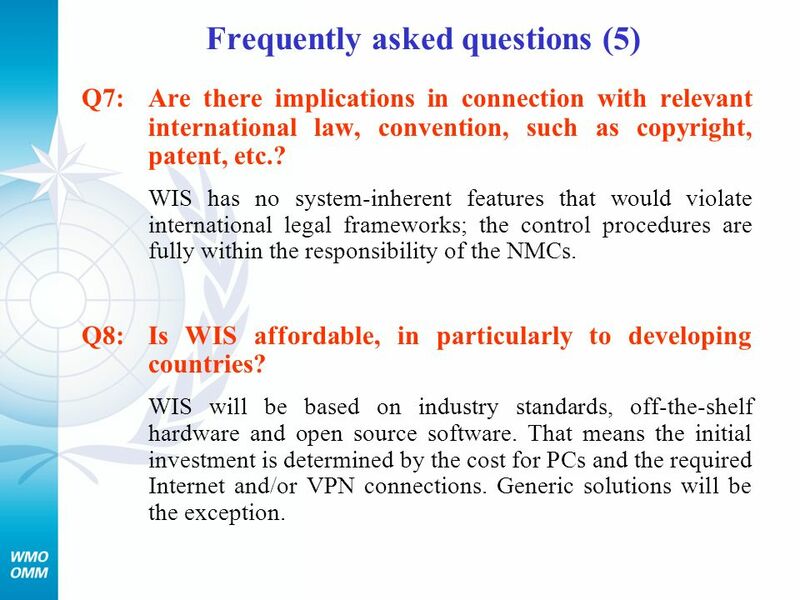 Q8:	Is WIS affordable, in particularly to developing countries? 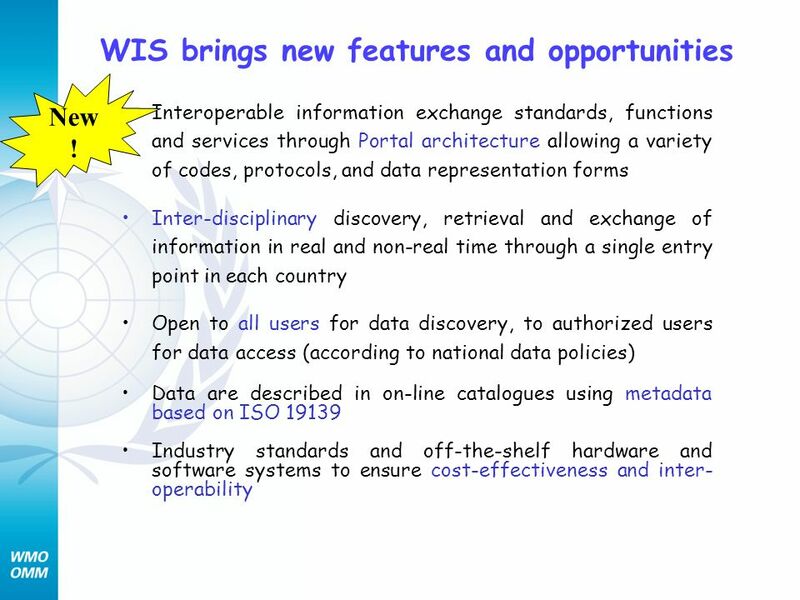 WIS will be based on industry standards, off-the-shelf hardware and open source software. That means the initial investment is determined by the cost for PCs and the required Internet and/or VPN connections. Generic solutions will be the exception. 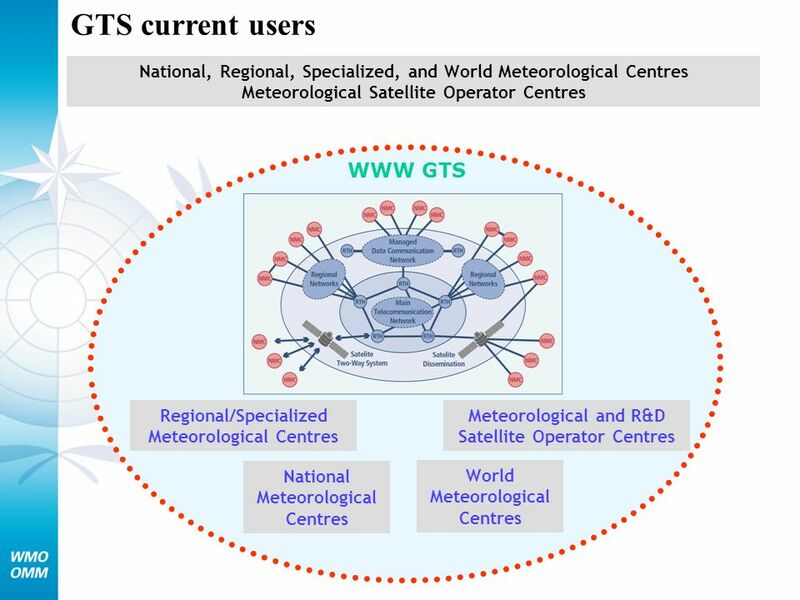 Download ppt "WMO Information System (WIS)"
An outline of the GTS & the Improved MTN project for FWIS By Hiroyuki Ichijo Japan Meteorological Agency ISS/ITT-FWIS 2003 (Kuala Lumpur, October. 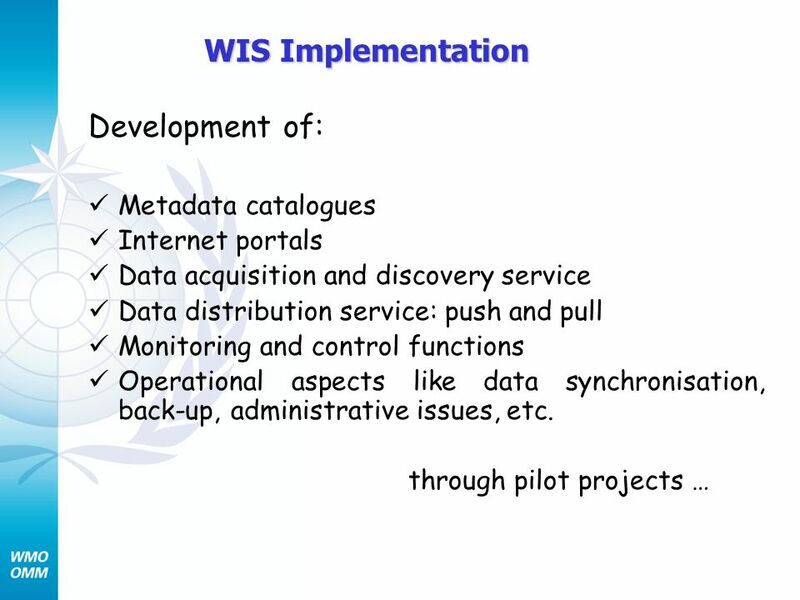 WIS DATA-COMMUNICATIONS FUNCTIONS AND SERVICES WIS shall provide various types of services (with different quality of service) to meet the different requirements. 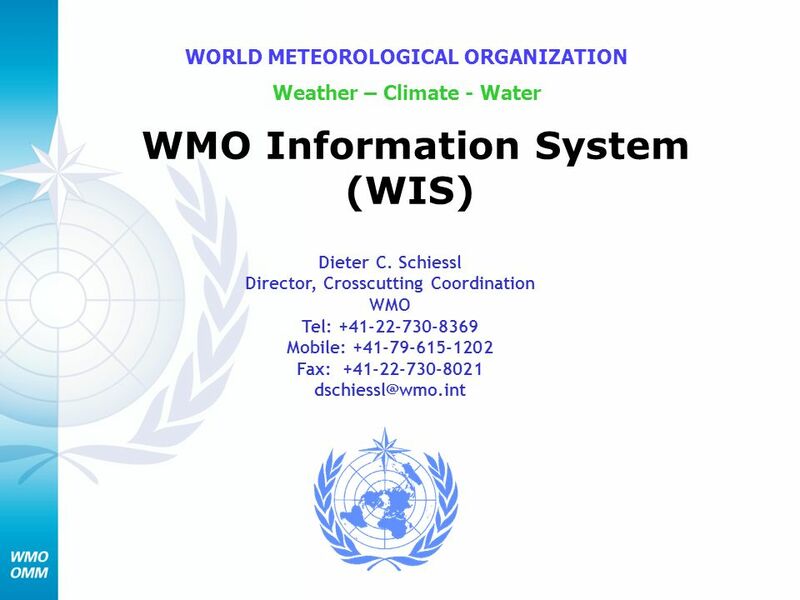 1 World Meteorological Organization WMO Information System (WIS) Managing & Moving Weather, Water and Climate Information in the 21 st Century WORLD METEOROLOGICAL. 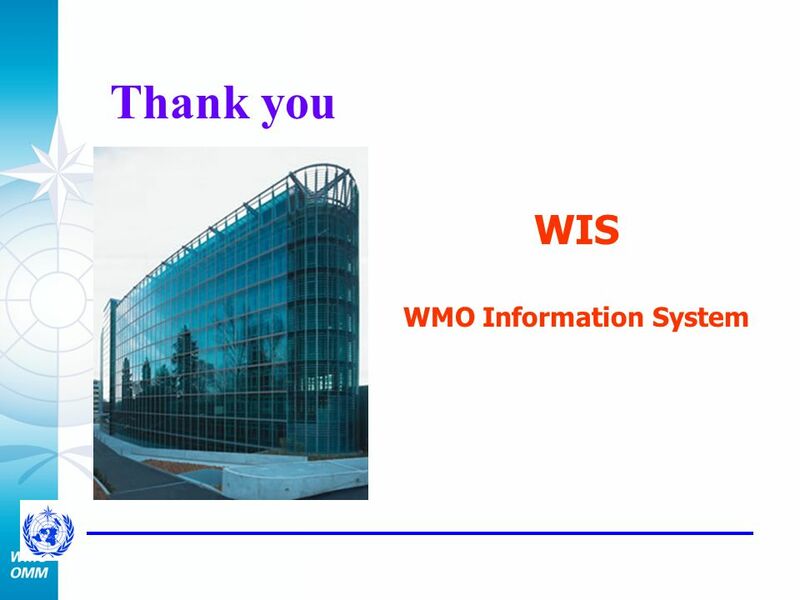 World Meteorological Organization Working together in weather, climate and water WMO Information System (WIS) Meeting of the ET-WISC Feb 2010 David. 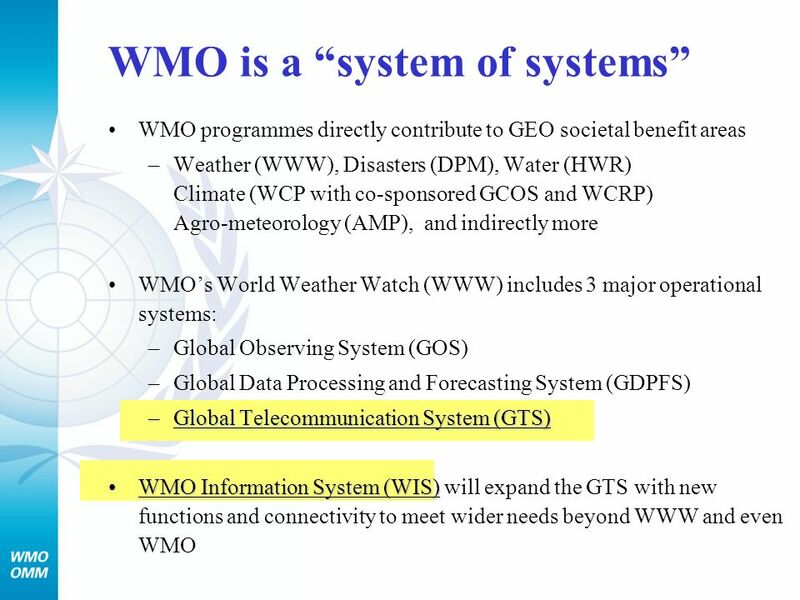 World Meteorological Organization Working together in weather, climate and water Review of relevant documents to the WMO capacity development activities. 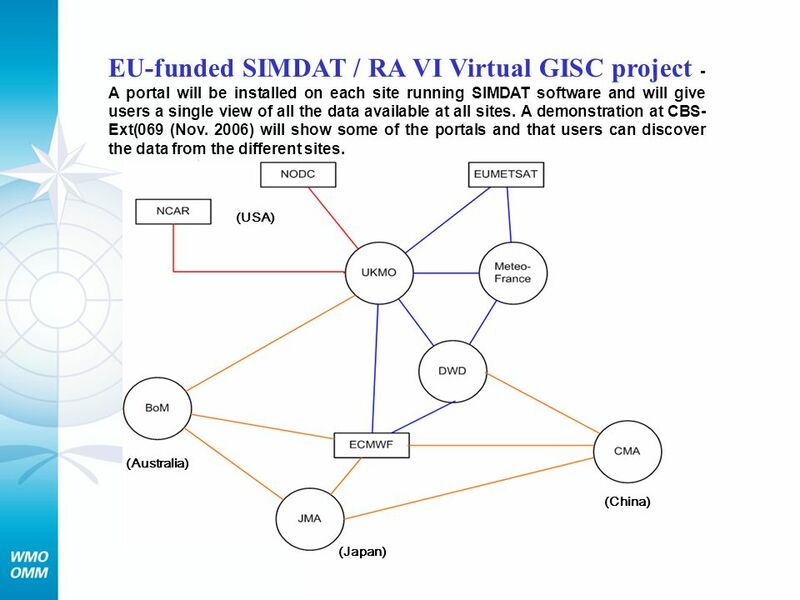 GISC Development in JMA Doc. 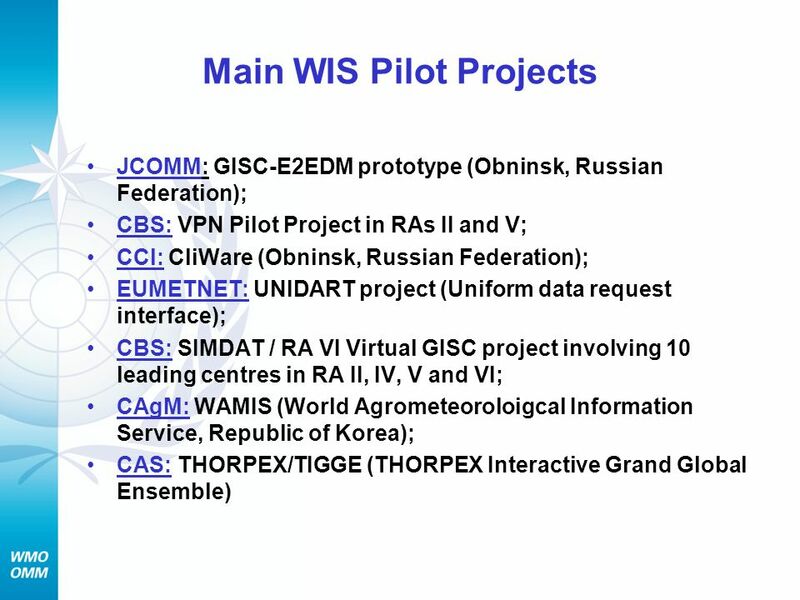 4.5 (1) Presentation version ICG-WIS-6 (Seoul, February 2010) Hiroyuki ICHIJO (Co-chair of ET-CTS) Please consider our. 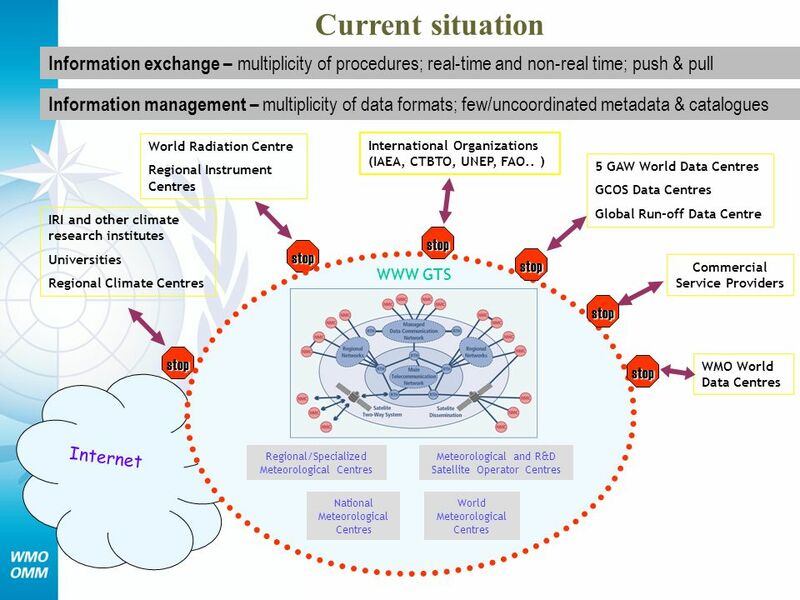 1 Operational Meteorology for Natural Disaster Prevention and Mitigation Alexander Gusev Acting President of the WMO Commission for Basic Systems. Information Space WS, Frascati, 3 Apr 2007 Kaiser & Hollingsworth, HALO, 1 HALO Technical Recommendations for GMES Johannes W. Kaiser & Anthony Hollingsworth. 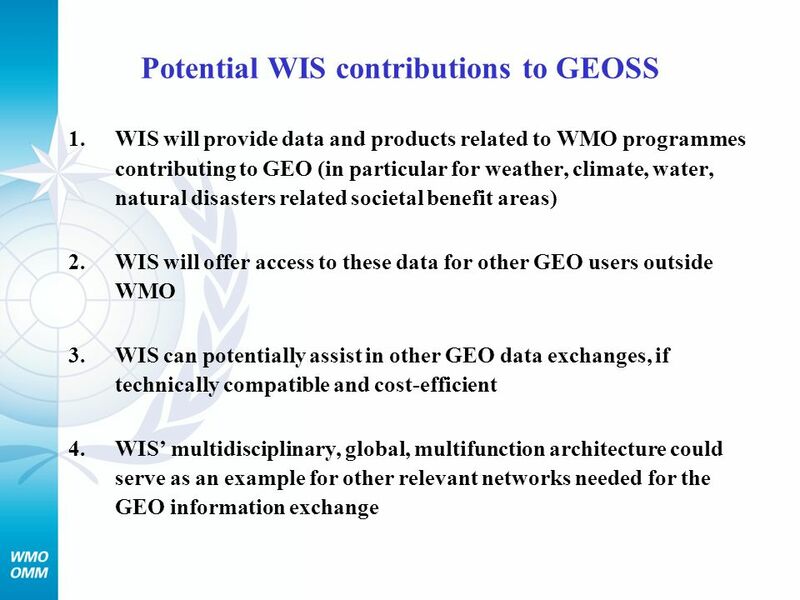 HALO Harmonised Coordintion of Atmosphere Land Ocean Integrated projects in the GMES Backbone Interoperability of WIS (> GTS + EUMETNET+ GEONET) with other. 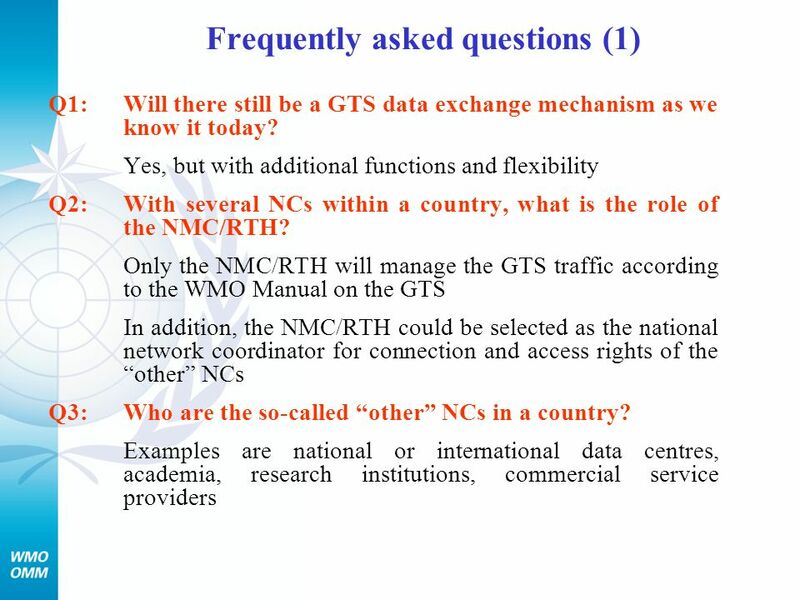 RTH AND NMC FUNCTIONS FOR GTS INFORMATION EXCHANGE T.K.RAY RTH,NEW DELHI,INDIA E Training Seminar on information and communication. 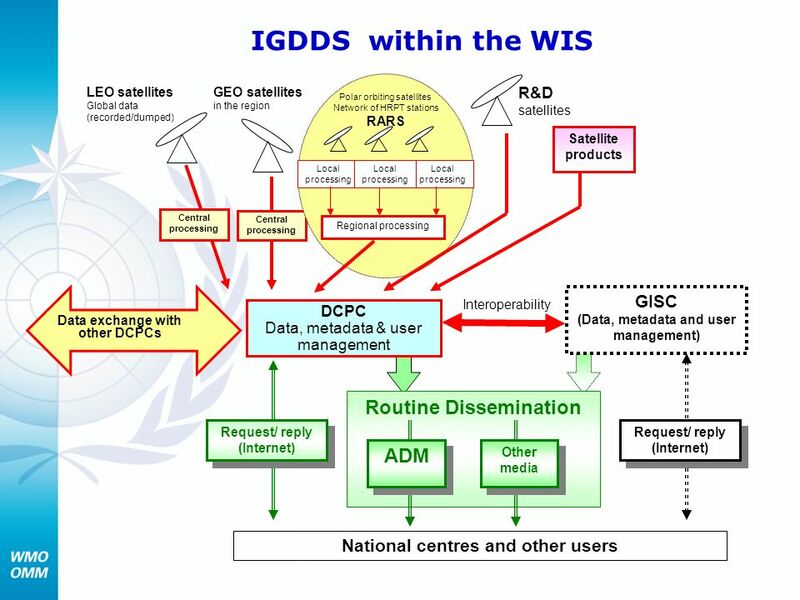 Experience with V-GISC/DCPCs Okki Lee, Ph.D. Korea Meteorological Administration 16 July 2008. 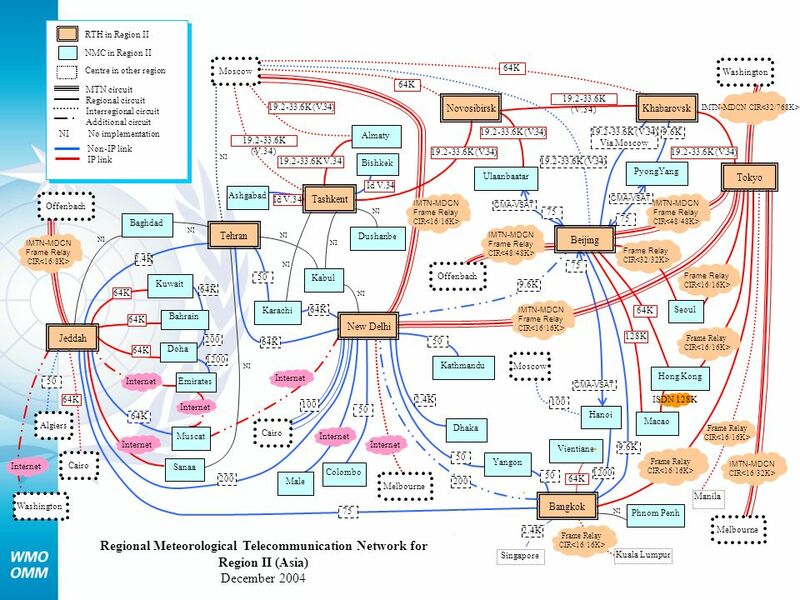 November 2006 TECO-WIS, Seoul 1 Definition of the Internet Network of networks –millions of smaller domestic, academic, business, and government networks. 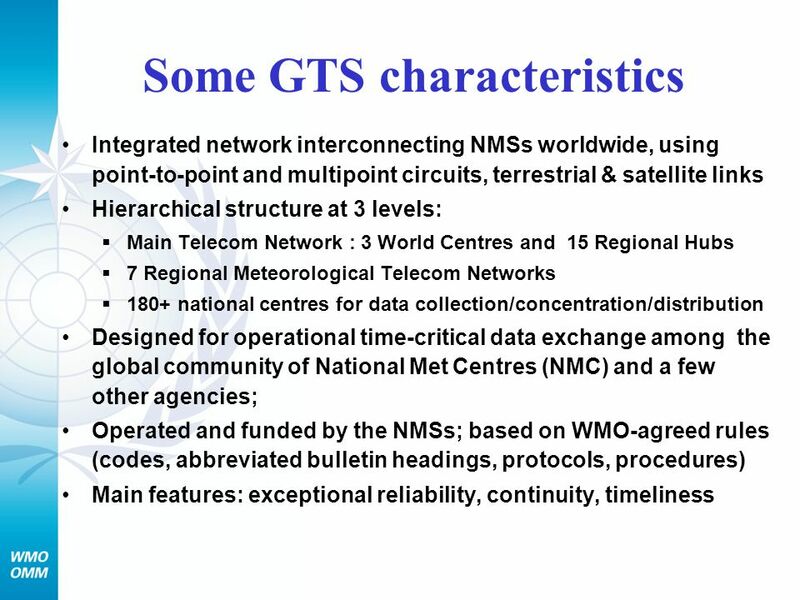 CMA’s new GTS system Submitted by YANG Genlu, China 2004.5.